For Lolly Night, we sat down to watch The Fall (Dir: Tarsem, 2006). I had heard about this film some time ago and kept meaning to see it. The director, Tarsem Singh, was known for making music clips and TV commercials before embarking on this film. Much like Russell Mulcahy, who directed a heap of Duran Duran, Elton John and Bonnie Tyler film-clips before going on to make films such as Razorback (1984), which was like Jaws, except with a wild boar instead of a shark, and Highlander in 1986. I have found that film directors who cut their teeth on TV commercials and video clips tend to have a very economical way of telling a story and a great visual style. This is because they usually have 30 seconds to four minutes to get a story across. The Fall is set in a hospital in Los Angeles sometime in the 1920s and centres on a little girl who is there with her arm in plaster. She strikes up a friendship with a Hollywood stuntman who is bedridden after an on-set injury. To pass the time, he tells her a story about a mythical band of men who are determined to kill the villainous Governor Odious, who has betrayed them all in one way or another. Visually, this is a beautiful film, especially when you consider that no CGI effects were used. The most striking fact of all is that this film was shot in 28 countries over a four-year period. I have to say that this film is worth watching just for the opening titles alone. Shot in black and white and played in beautiful slow-motion, it gives the viewer the background story as to how the stuntman got injured. Earlier in the day, we all went into the city. The kids are about four weeks away from semester break and my wife and I have informed them that we'll be taking a few outings here and there. Since the Thailand trip two months ago was the big expense, we figure we may as well have a few cheap thrills for a while. I took a closer look at this classic mid-Sixties Contograf to find some tiny nicks and scratches here and there on the case. As I was approaching this display, I had already suspected that this watch was a vintage piece, based on its size, and sure enough, it was. The saleslady that I spoke to explained to me that the owner of the store had over three hundred watches (and I thought I had it bad) and some of them were displayed throughout the store. 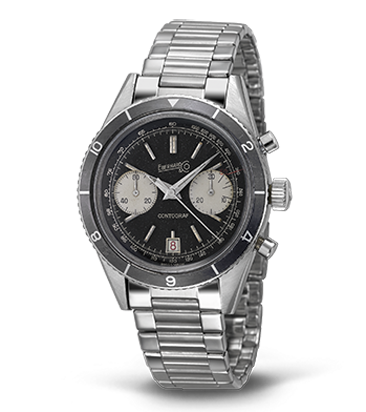 A nice idea, to be sure, but it back-fired with me because I found myself liking the vintage watches instead of the new (and displayed to sell) re-editions that were based on some of these vintage models. Geez, that's a bad photo. Maybe this one's better? Another day of industry placement. It's going okay. I have two more shifts after this one. Then, I'm gonna keep my ear to the ground regarding actual paid work in a library. I may do some voluntary work at my kid's school library if I can swing it. I'm not entirely certain if I have read the stories in this collection, but I learned earlier this year that a bunch of Hammett's writings were found...I can't recall exactly where, University of Texas, maybe?...a couple of years ago and they were due to be published soon. I'm currently reading a novel by Dan Fesperman entitled The Double Game. It's very good so far. Sort of a love letter to spy fiction. Very clever. I had to go into town. I was meant to go in last Wednesday to see the "Mirror of the World- Books and Beyond" exhibition at the State Library, but I stayed home with my sick daughter instead. And also, I saw a great trench-coat at a great price on the weekend and I wanted to have a better look at it. My Burberry trench is getting on in years (I bought it in 1987. Read all about it in my 'Man With a Hat' post from early last year) and I've been on a passive hunt for a replacement because there's absolutely no way I'm paying 2014 Burberry trench-coat prices. More importantly, their current range is too damn short. Not a trench-coat. More like a longish jacket. And that won't do. The weather was a little cool. I grabbed a coat. I planned on travelling light. No bag or satchel. The pencil case was a tad overkill, but I had a pocket in my coat where it wouldn't get in the way. 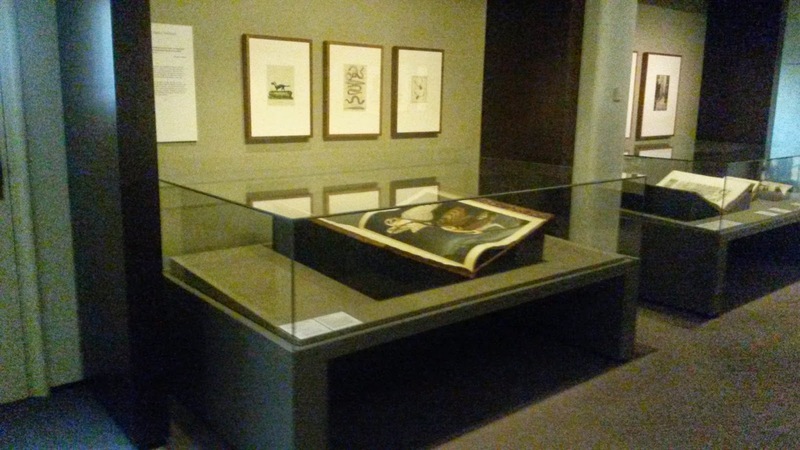 It was a nice exhibition, on long-term display. I took a few notes and pictures. 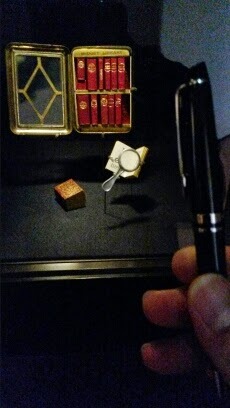 And the smallest books were in this set of miniatures, known back then as a midget library. This set, made in circa 1895, contained a Bible, a Qu'ran, French, English and German dictionaries, and a book of poems by Robert Burns. I'm sure they were all abridged versions, heh, heh. I held my pen up against the glass. The books were one the other side, about six inches away. And this scroll looked amazing. I can't recall what it was. To the left of it was a bound copy of The Qu'ran. Just above that was a tattered leather satchel that was used to house this sacred text. Extraordinary. Excuse the quality of the photos. They were taken with my phone. If I'd known I could have brought a camera, then I would have. Looks like I'll have to go back and take a longer and more detailed look at all of this. Even on an overcast day, it lights up quite impressively. 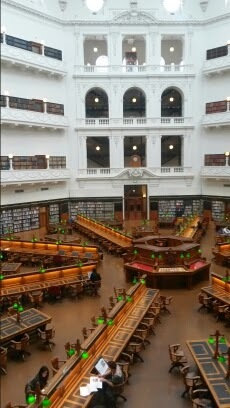 Or maybe it's all that knowledge and history in print that gives this domed Reading Room its glow. Either way, it's always an impressive sight. Happy Birthday, Miss Honor Blackman. She's doing well. It has often been said that if you wanted to explain to somebody what a James Bond film was all about, you would just tell them to watch Goldfinger (Dir: Guy Hamilton, 1964). That's the movie that pretty much explains all of the motifs, tropes and 'ideology' behind the Bond films. Well, at least until Casino Royale in 2006. I got home from my second-last shift of industry placement. It was getting a little chilly. Time for a thicker layer of clothing. Man, that Dewar's scotch goes down a little rough. Some of you may have noticed that I'm a day late with this post. Ah well, it ain't the end of the world. Anyway, gang, thanks for reading and have a great weekend. And one more pic of the Seamaster 300. Yes, the picture was taken yesterday, but I'm still wearing it today. 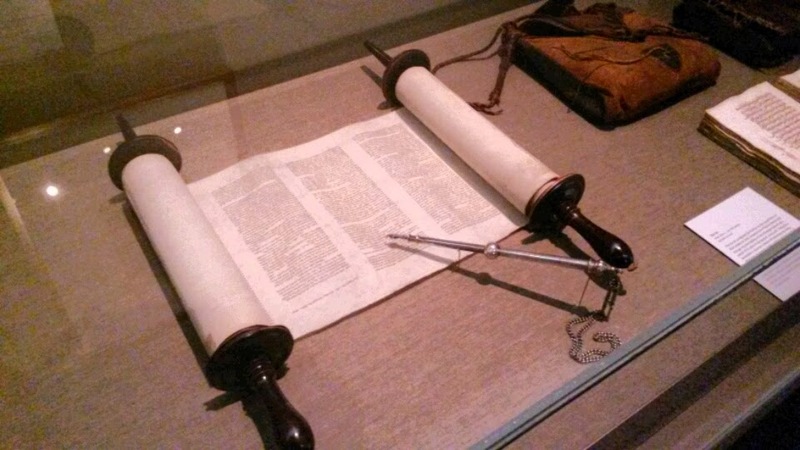 The scroll looks like a Torah with a pointer. Nice exhibit! We missed "the Fall" when it was out but it sounded good as you described it. I had an outlier post recently too. My spy exhibit post got many times more hits than usual. You may indeed be correct, NA. Thanks for that. Last thing I want to do is offend any faith. And yes, catch up with "The Fall" if you get a chance. Beautifully made film. I had the same problem with one of my blog entries. Apparently everyone around the world owned an IBM WheelWriter 2 and were eager to read about it. I changed that entry to draft and the excess traffic has (sort off) been checked. Now, why was that entry "targeted" I don't know; but I have an inkling it has something to do with the way Google search engine works. I've experienced similar interesting spikes of activity on my own blog in the past. Mind you, it hasn't taken me to the same numbers as yourself. Dewar's huh... We've been enjoying a bottle of Quinta Ruban here of late. But... sadly it is looking close to finishing. And thanks for reminding me. I've been meaning to watch 'The Fall' for a while now, and have sadly not done so. Boy Meets Girl...Sooner Or Later.